Oh my goodness! This is one of my new favorites! I decided to switch gears and try a different type of smoothie (I have been set on my cacao smoothie). However, today I was in the fall flavor mood, apple pie sounded good! I experimented and came up with this delicious goodness! Add all ingredients together and blend blend blend! I was honestly really amazed at how much I enjoyed this smoothie. You can always add in some spinach, I unfortunately ran out this morning. Let me know if you try it! I am so excited for fall: weather, clothes, and most of all the food! 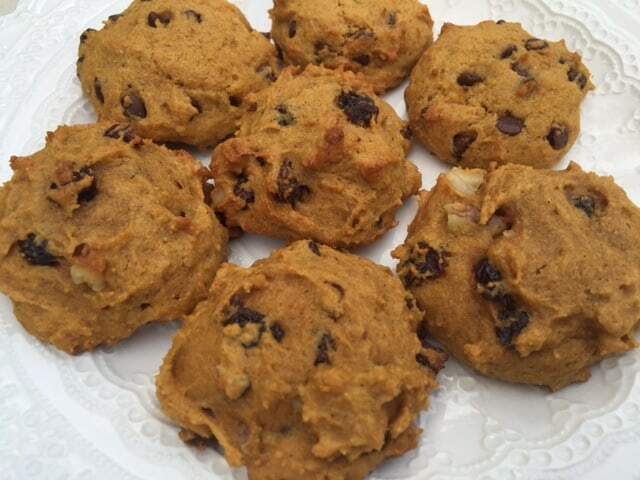 Pumpkin screams fall and what is better than a warm, chocolatey, ooey gooey pumpkin cookie? Here is a healthy sweet treat to try this season! Preheat oven to 350 degrees. Mix the dry together (flour, salt, baking soda, spices). Next add in remaining ingredients and stir until combined. Roll into small/medium balls. Place on a cookie sheet and bake for about 9-12 minutes. I’ve been really into protein shakes lately after my workouts because I not only get protein for muscle recovery, but I can also get a few serving of vegetables without the taste! What I like most about this shake I threw together is that it tastes like chocolate, my favorite! Benefits: This shake has the spices turmeric and ginger. Turmeric and ginger are key ingredients to shrink the waistline by reducing inflammation. They also help with clear skin, and muscle soreness and pain. Black pepper is important because it helps the body to absorb the turmeric. Try this for your next recovery shake, you will not regret it.